Your voice matters to us at the European Economic and Social Committee (EESC). We want to know what is important to young people in Europe, get their take on today’s challenges and work together to find solutions. It’s a big year for both YEYS and the EU. In 2019, YEYS celebrates its 10th anniversary and a decade of giving a voice to young people from all over Europe. 2019 is also an election year, and the new European Parliament will have very important decisions to make. 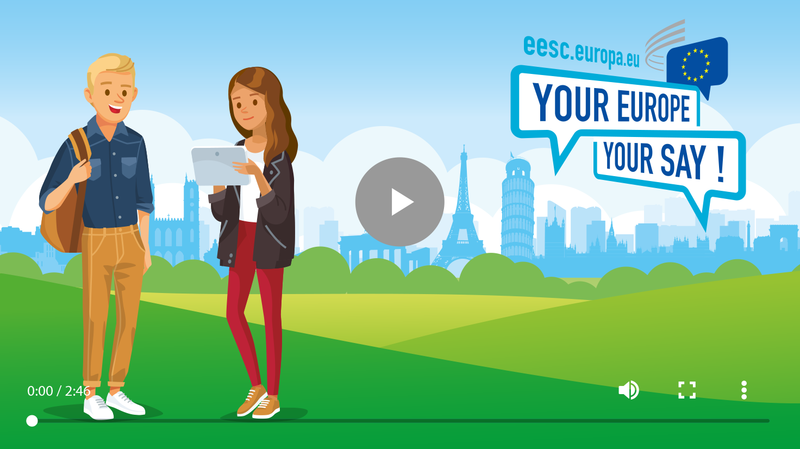 Although you might be too young to vote, that doesn’t mean you don’t have something to say – and the EESC is all ears. You can no longer register your school for the 2019 edition, but you can follow the event to see how your peers vote on issues such as getting more young people involved in politics, protecting democracy, stopping the spread of fake news and making it easier to play in part in the development of the EU. 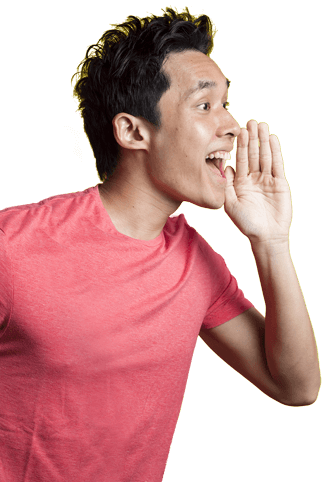 Tune in on 21-22 March 2019 to follow the debates and watch this space for information on getting involved in YEYS 2020! 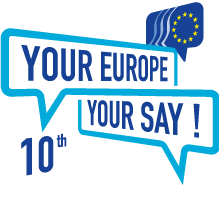 Our YEYS Community is a new way for students and teachers who took part in a YEYS event to keep in touch – both with each other and with the EESC. Employers, trade unions and professional and community associations representing consumers, young people, people with disabilities and others all have a seat at the table. As a consultative body, the EESC issues opinions that help shape European policy, giving it a distinct place in the EU’s decision-making process. Young people come to YEYS to tell the EU what matters to them and to share their ideas for their future in Europe. Although issues have moved on and off the radar over the years, there have been some constants. Our culture is our story. It is the shared narrative that binds us together. In many ways, culture is the very essence of the European Union. At home, it inspires innovation and solidarity while promoting peace and inclusion. Abroad, it is our soft power – a door to dialogue, a dam against the rising tide of nationalism. Culture is a powerful resource for creating a new European story – an inspiring narrative that can help restore confidence in the EU and reconnect Europe with its citizens. The EESC strongly supports initiatives like the European Year of Cultural Heritage, with its focus on the diversity of Europe’s cultural heritage and the opportunities this richness represents for a better quality of life. The Europe of tomorrow will be defined by new challenges, new technologies and new industries. Through quality education, effective training and lifelong learning, society can ensure that Europe’s young people – its future citizens and leaders – have what it takes to make a difference. Through education, we can promote shared democratic ideals and common European values. To achieve this, the EESC has defended the right to a quality education, apprenticeships and traineeships – which we believe are key to providing young people with a fair chance in an inclusive labour market. The EESC’s work helped shape EU policies like The European Pillar of Social Rights, which guarantees every EU citizen an equal right to good quality education and opportunities to learn, regardless of their disabilities, background or specific needs. Programmes like Erasmus+, which allows young people to travel abroad to study and volunteer, along with the New Skills Agenda, give everyone a better chance of learning skills that can help them get and keep a job in a very competitive world. 14.9% of young people in the EU are unemployed – up to 30% in some countries. Clearly, more must be done to ensure that all Europeans have an equal opportunity to build the future they hope for. To achieve this, the EU is working to create more and better jobs that are fit for a rapidly changing, technologically demanding workplace. The EESC has repeatedly asked EU institutions and countries to invest in young people, in their skills and their future. The Committee’s members represent people with solid experience in the labour market and can help employers and workers make their voice heard. The EESC’s opinions on all the main measures taken by the EU to reduce youth unemployment have helped shape policies like The European Pillar of Social Rights and the Youth Guarantee, which guarantees all EU citizens under 25 a job, apprenticeship, traineeship or a place in education within four months of becoming unemployed or leaving education. The decisions we make – or don’t make – today to protect our environment and fight climate change will impact our world for generations to come. They will change your future forever. From rising temperatures and sea levels to the decline in air quality and in the variety and differences of plant and animal species on Earth (biodiversity), these are global problems that require global action. A perfect example of the type of global cooperation we need is the Paris Agreement on Climate Change. This agreement brought 195 countries together to take action against climate change. International solutions like the Paris Agreement tell us what needs to be done. The work, however, must happen at the local level: in your country, city, town or village. The EESC believes that everyone has a role to play in the fight against climate change. This is why, together with our partners, we have formed an international coalition on climate change made up of citizens and grassroots organisations. Every year, the world wastes 1.6 billion tonnes of food. The EU alone wastes 100 million tonnes. Despite this huge amount of waste, some 795 million people go hungry around the world, and over 40 million people in the EU can’t afford a decent meal every other day. That’s the equivalent of over half the population of France. Wasted food is not just an ethical issue, it also effects the environment. For example, it’s responsible for 8% of the global greenhouse gas emissions that contribute to climate change. As global temperatures increase, so too will flooding, droughts and diseases – which will make it harder to produce enough food in some parts of the world. We need to produce and manage food in a way that doesn’t damage the environment and makes sure everyone has enough to eat. Cutting food waste is one part of the puzzle and, as underlined in its opinions and studies, the EESC believes that food donation can go some way in reducing waste and helping those in need. However, donating food comes up against many obstacles that need to be tackled to make it easier and so more frequent. Complicated problems require innovative solutions. As highlighted in the Committee’s opinions, the innovative solutions needed to create an integrated, sustainable EU food policy must happen in our communities. Migration is a topic that dominated European headlines in 2016, and an issue with no simple solution. The key is a responsible and balanced immigration, asylum and integration policy in line with European values and principles and with human rights. To be successful, immigration policy must come with measures that help people integrate into our society. This means recognising their qualifications so that they can work, promoting entrepreneurship so that they can start a business and encouraging women immigrants to follow their own goals in our society. The EESC’s study group on immigration and integration (IMI) promotes the development of such a policy via the involvement of interest groups, many of whom work directly with immigrants. Along with the European Commission, the EESC jointly organises the European Migration Forum, a platform that gives a voice to civil society organisations working in the field of migration and integration. The EESC has published several opinions on various topics relating to integration, emphasising, for instance, the need to provide migrants with the vocational and language training they need to find a job. Also, recognising foreign diplomas and promoting entrepreneurship are methods for helping better match a migrant’s skills to the actual needs of our society. Ending poverty, protecting the planet, promoting human rights and guaranteeing prosperity for all: the United Nations Sustainable Development Goals aim to meet all of these ambitious objectives. The goals provide the blueprint for action, it’s now up to all citizens to carry out concrete action in the EU to make this future a reality. Solidarity, human rights, social justice, equality, democracy, entrepreneurship and environmental responsibility: the UN’s goals are Europe’s goals. This is why the EESC believes the EU should use these goals to build a more sustainable and inclusive Europe. A place where economic development does not destroy our precious natural resources and a society in which there is a place and a role for everyone. The EESC’s Sustainable Development Observatory (SDO) ensures that the principles of sustainable development are included in all EU policies.